When I started putting together the metronome audio samples, I thought I'd be clever and throw in some samples of an odd time signature - 5/4 time - you know, just as an example. As I was working through the recording process, I decided this was probably going to cause more confusion than it was worth. So for the time being, we will stay within the most common time signatures you'll find in rock music and some of the patterns you will come to know and love. When you start up your metronome to practice, you need to know three things before you pick up your guitar: the practice tempo, the time signature and the subdivision. This was covered on the "how to use a metronome" page, so I won't go into a lot of explanation here. First off, what speed (tempo) you will start with? How do you know? Well, if you are working on learning a song, you obviously need to know what the tempo of the song is so you can match the speed while you practice. I'll cover this a bit more below. If you are practicing techniques and scale-type exercises or riffs, or you are working on perfecting your timing, it's best to start at a slower speed and increase the speed in increments. Next you'll need to know the time signature (how many beats per measure and how much time is each beat worth) and finally the subdivision of each beat. 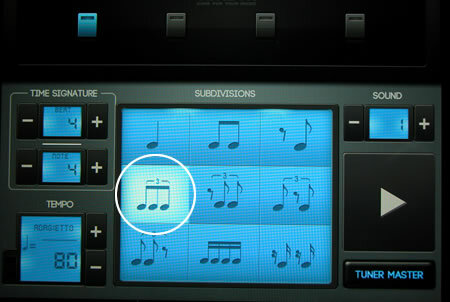 If the subdivision is one, it's simple - it's just a single count for each beat. If the subdivision is, say three, each beat equals a triplet (three counts for every beat). 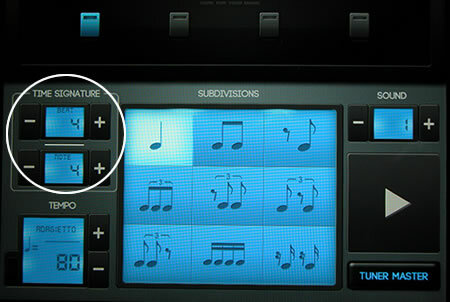 Once you have values set, just press the 'Start' button on the metronome to start it up. We'll start with 4/4 time (when people talk about it, they say "four, four time") for our metronome audio samples, as this is by far the most common rhythmic structure in Rock. For a quick recap, the first number 'four' stands for the number of beats in a single measure (a measure is just a segment of time in a song), and the second number 'four' is the time value of each beat. In this case, the beat is a quarter note. So in a measure, there are four beats counted. Don't worry if this seems confusing - it won't when we're done. The first metronome audio samples show a subdivision of one count (quarters) per beat. The second example is a subdivision of two counts (eighths) per beat. The third subdivision is a count of three per beat, which is usually referred to as triplets. Finally we have a subdivision of four counts per beat. In essence, you have broken each measure down potentially into sixteenth notes, if you happen to be playing a riff that fast! These are not the only subdivisions, as you can see from the diagrams. These are simply the most common you're going to encounter as you play rock songs, so it makes sense to practice these. Now we'll look at 3/4 time (the time signature) metronome audio samples. 3/4 time gives a different feel from 4/4 time and can take a little practice to get used to. This isn't exactly related to metronome audio samples or using a metronome, but it's a very cool demonstration of sympathetic resonance (which I've talked about before) - using metronomes. I thought it was worth sharing. If you have an unreliable internet connection or you don't have a physical metronome or app on a smartphone and you would like some metronome tracks to play along with, you can download these free metronome audio samples. This is a great option as you can have the mp3 files saved on your computer, which will guarantee there is no latency from a slow internet connection. Another great option is to purchase backing tracks. 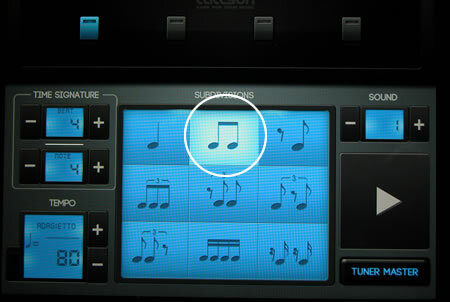 A backing track basically gives you a backing band to play along with. Practice your chord changes and timing, practice creating leads, or create harmonized guitar parts to the existing guitar parts. This allows you to work on technique without having to compete with a singer or lead guitar player. 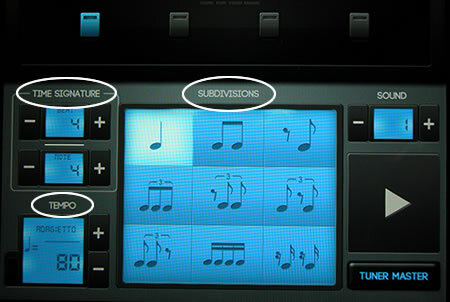 Backing tracks are a really good tool to have in your arsenal. Practicing with a metronome is something you should really consider adding to your practice sessions. There are few things more important for a musician than developing your rhythm and timing. You can be the fastest shredder out there, but if your timing is off and you can't stay with the beat, you're not going to last long in a band. 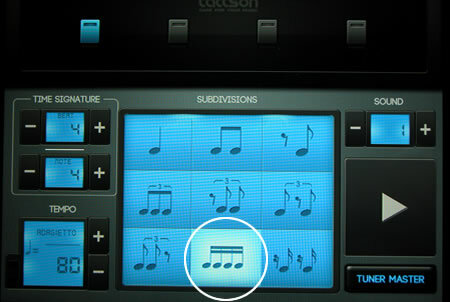 Get yourself a good metronome and use these metronome audio samples to improve your playing.